We are a very active and friendly Club which was established on 6 July 1989. One of our core values is to offer the club members top-class diving for all. Our club members organise all the diving and we dive throughout the year, as often as members want to! The club aims to cater for all diving preferences, be it wreck diving, scenic diving, drift diving, shallow or deep diving. The branch openly embraces and encourages emerging diving technology and in this also, caters for the diving preferences of our rebreather divers (closed circuit and semi-closed circuit, nitrox, and trimix), and open circuit trimix divers, of which we have a good presence in the club. Club members organise a vast variety of diving. On a weekend or mid-week basis we utilise our Club RIBs (rigid hull inflatable boat), or charter boats for diving anywhere along the south coast, from Brighton to Lyme Regis. On a weekend or long-weekend basis, we organise dive trips to many top class destinations around the UK, again using our RIBs or locally hired boats: Isle of Wight area, Portland, Plymouth, Lands End Peninsula, SW Wales, and Farnes Islands. And, by the same token, our long-range expeditions regularly take us to Scapa Flow (Orkney), NW Scotland & Hebrides, SW Ireland, Isles of Scilly, Land's End Peninsula, Normandy, Brittany, Norway, Gibraltar, just to mention a few - many using our club boats. When things get rather chilly in the UK, the club then ventures somewhere warm: Red Sea, Gozo, South of France, Lanzarote, Cuba, Bikini Atoll, South China Seas, Truk Lagoon. In all, we try to cater for all diving tastes and preferences in an open and friendly environment. We have one modern and economical Tornado 6m RIB and a Delta 5.5m RIB, both equipped with full safety and navigation equipment. The RIBs are insured to operate up 20 miles from the nearest point of land, and we regularly venture to the best off-shore sites in safety and comfort. The Club has 5 sets of SCUBA gear for use free of charge by branch members during their training and for a small fee for subsequent open-water diving. Top-class training is another of the Club’s core values. We have many Nationally Qualified Instructors and offer the full range of BSAC training courses for Ocean Diver, Sport Diver, Dive Leader and Advanced Diver in a safe and progressive environment. Full support is available for anyone wishing to progress to 1st Class Diver, the highest BSAC diving qualification. Our wide range of instructor expertise and qualifications means that we can offer a range of BSAC skill development courses. Those include: Boat Handling, Dive Planning & Marshalling, Chart work, Search & Recovery, O2 administration, Basic & Advanced Nitrox, First Aid for Divers, Lifesaver, Advanced Lifesaver, to name a few. On this, we also join with other branches to share the full benefit of the BSAC’s Southern Region coaching scheme. Already qualified with another agency? Want to join a BSAC club and have non-BSAC diving qualification? 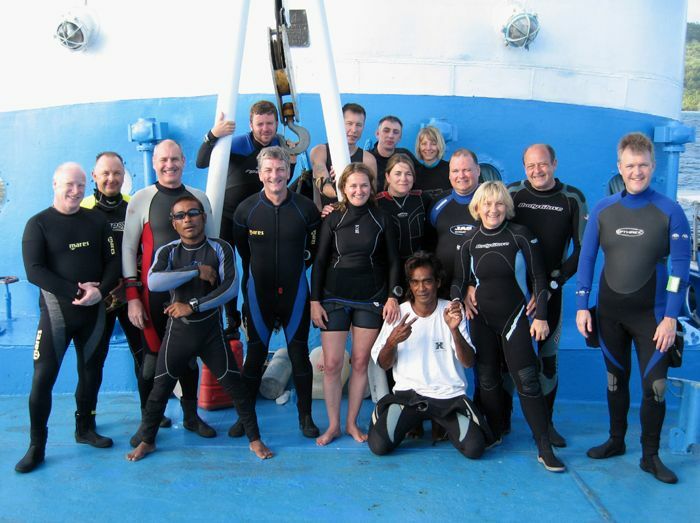 We welcome divers who have learned to dive with other agencies (PADI, SAA, NAUI, etc). We can also offer you BSAC crossover training programmes, which allow you to build upon what you already know. We meet at the Binfield Club on the first and third Friday evening of every month to train, plan dives and socialise. So, if you’re interested in joining or want to find out more, please get in touch with us! This page last updated on 08/01/12 @ 11:31PM.